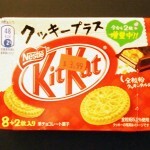 Review: Kit Kat Cookie Plus | Oyatsu Break! 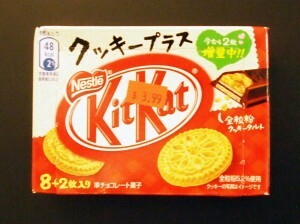 One of the flavours acquired over the past few years from the import-candy stores located in Markham’s Pacific Mall (30 minutes north of Toronto) is “Cookie Plus!” At some point I’m going to have to do a little write-up on the good folks at Pacific Mall who keep me in Kit Kats in between trips to Japan. 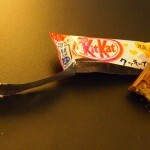 But for now, lets review some Kit Kat! 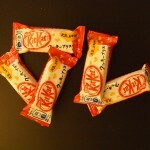 Packaging: As I mentioned, its set up in the format of Cheese Kit Kats, which is to say a box containing individually-wrapped Kit Kat fingers, weighing in at 48 calories each. 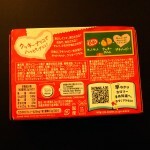 The packaging is a bit… huge considering that the box only contains 10 little Kit Kat fingers, although the design is fun. It’s a bit kitcheny, with cookies, placemats, adorably hand-written-esque writing. It’s not bad, but it seems a bit directed-at-housewives for my tastes. Scent: With this having expired last year, I wasn’t really expecting a lot but there’s still a nice chocolatey smell, but the overwhelming scent is of cookies. Not quite shortbread, not quite vanilla, but a sort of a straight-ahead cookie smell that I’m finding hard to place. 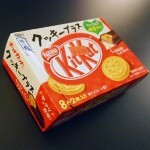 It smells like the cookies pictured on the box, basically. Taste: Kit Kat Cookie Plus is probably the closest to the original taste of Kit Kat of any of the Japanese varieties, at least so far as I’ve tried. 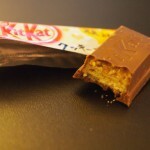 Where it really differentiates itself is in texture, as some of the wafers have been replaced with additional crunchy cookies, giving it the taste of a standard Kit Kat with a little more wafery, cookie crunch, and taste. The chocolate is nothing to write home about, again, standard-issue milk chocolate. 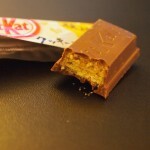 But as a snack it’s actually really good, and is just close enough to regular Kit kats to probably find a foothold in North America. Verdict: I dug it! Admittedly, the cookie could’ve been a little bit nicer, it was a touch stale I thought, but I blame the expiration date rather than the product itself. I’d give this one another go if they ever produce it again.